I found the spot where he had sat to do his drawing … The waterfall was almost exactly as it was in von Guérard’s picture. He was at Strath Creek on 14 January 1862; I was there 23 January 1980. William Delafield Cook’s excitement is palpable at the recollection above, of his visit to the site of the waterfall painted by Eugene von Guérard (Waterfall, Strath Creek 1862, in the Gallery's collection) more than a century earlier. He greatly admired the 19th century artist’s painting for its topographical accuracy and evocation of a metaphysical dimension. It accorded with his own long-held aim to transcend the familiar through a hyper-realist approach that melded photography with painting. A meticulously crafted work of extraordinary beauty, Delafield Cook’s painting was worked up in the studio from photographs taken on the spot, with direct reference to Von Guérard’s earlier composition. It bears a ‘charged’ intensity characteristic of Delafield Cook’s approach. Homage to both von Guérard and to the unique atmosphere of this landscape feature, with its miracle of water amidst the dun colour of dry hillsides in the heat and stillness of summer, it was awarded the Wynne Prize for 1980. This work was acquired by the Gallery in 1981. Signed and dated u.l. corner verso on canvas, black fibre-tipped pen "W DELAFIELD COOK/ 1980-1". Signed top c. to c. verso on stretcher bar, sideways, red fibre-tipped pen "W DELAFIELD COOK". Signed top c. verso on stretcher, red fibre-tipped pen "W DELAFIELD COOK". Nancy Borlase, The Sydney Morning Herald , 'Portraits in search of a prize', pg. 2, Sydney, 28 Feb 1981. Brian Hoad, Bulletin , 'Shock and distress at the gallery', pg. 77-78, Sydney, 10 Mar 1981, 78 (illus.). Kate Legge and Jill Sykes, Age , 'Archibald trustees left in a quandary', pg. 1 & 3., Melbourne, 28 Feb 1981. Sandra McGrath, The Weekend Australian , 'Archie: not so bald as tonsured', Sydney, 28 Feb 1981-01 Mar 1981. Linda van Nunen, Studio collections , 'William Delafield Cook', pg. 148-151, Double Bay, Dec 1987-Jan 1988, 150 (colour illus. ), 151. Viki Wright., The Weekend Australian , 'We just want the artifacts, ma'am'', Sydney, 01 Aug 1981-02 Aug 1981. Archibald, Wynne & Sulman Prizes for 1980 , Sydney, 1980, 2. William Delafield Cook , Sydney, 1998, 171-172, 173 (colour illus.). 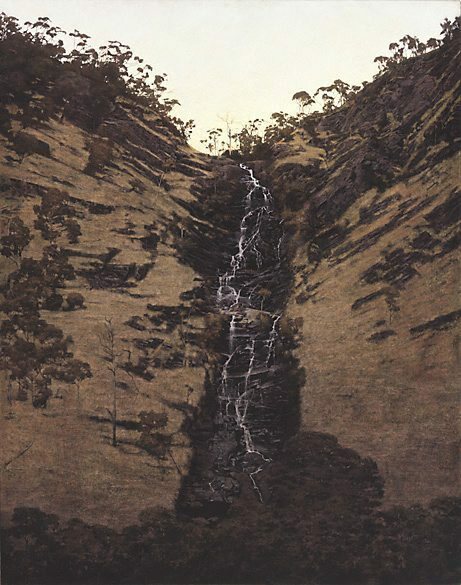 Australian landscape series , 'William Delafield Cook, A Waterfall (Strath Creek)', Sydney, 1987, (colour illus.). The Wynne prize: an Australian landscape tradition , Sydney, 1986, 31 (illus.). The Sydney Morning Herald , 'Trustees withold Archibald Prize', Sydney, 28 Feb 1981.